Note: This article was submitted by Seton Hall University to Essex County Place. 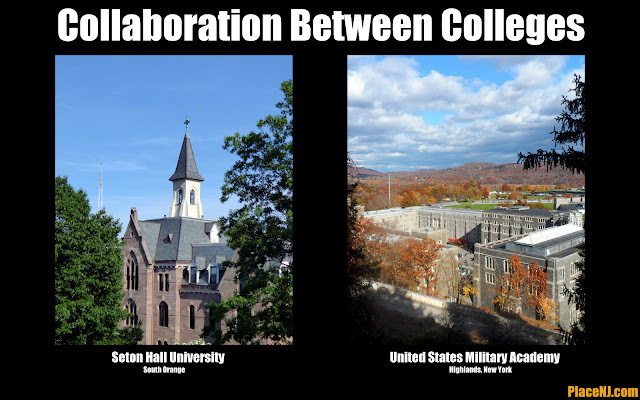 South Orange, New Jersey: In a first time collaboration, the Seton Hall University Stillman School of Business and the newly formed College of Communication and the Arts partnered on a leadership project which included further collaboration with the United States Military Academy at West Point. In the project, Stillman and public relations students worked together in teams to identify the essential traits of a leader and then presented their findings before cadets at West Point this Spring semester. Professor Angela K. Chitkara and Karen Boroff, professor and Stillman School dean emeritus, planned the merger of their classes for over a year in an effort to incorporate the vital role of public relations into the curriculum for Boroff’s Organization Behavior classes. “Organizational Behavior is all about leadership and what makes great leaders. The cornerstone of Stillman is to transform concept into practice, and this project fit the bill,” said Boroff. “Strong Communication skills equate to strong leadership skills. Often underestimated, communicating across an organization to its stakeholders is vital to the success of an organization’s ability to adapt to change, both internally and externally,” said Chitkara, who teaches Promotional Writing, which focuses heavily on press release writing and its implications in the business world, such as crisis communications. In the project, twelve teams of students, each comprised of five business students and one public relations student, developed a model of the essential characteristics of leadership. Using their models, each team identified a “best” and “worst” leader of 2014, using real-world models and media examples to justify their choices. Two teams were chosen to present their models and findings to West Point cadets, sparking lively debate on what defines a leader in a corporate and military setting. “Leadership is often the main topic of discussion between cadets and faculty at the United States Military Academy. However, hearing a non-military member's thoughts on leadership is rare. Listening to the students from Seton Hall discuss leadership was awesome,” said Cadet Steven P. Trizano ’15, who took part in the unique military-civilian collaboration as a student of Col. Diane Ryan, program director of General Psychology for Leaders at the military academy. Through the project, the Seton Hall students also developed communication and crisis management skills and learned the importance of a multi-disciplinary approach to business management. “I learned more about my own leadership style. I found that the Academy’s integrity code is one I can adopt anywhere as a developing leader. I can use this code for myself, my teams, and any future organizations,” said Stillman School of Business and Leadership Development Program student Anthony Pescetto ’16. In all, twelve students presented their leadership models at West Point. The first team – presented their “Visionary Engagement Leadership Model,” which blended aspects of charismatic and transformational leadership. They chose Kevin Plank, CEO and founder of Under Armour, as the best leader of 2014. The second team presented their “Authentic Progression Model,” which values trait, behavioral and situational leadership. They chose Brandon Stanton, Humans of New York photo blogger, as the best leader of 2014. Both teams independently chose Bill Gross, former fund manager at Pimco, as the worst leader of 2014.